Candidates eagerly waiting for there CDS 2 2016 (IMA, OTA,IAF, INA) SSB Center, Interview Dates and Merit List now can check the center allotment for their SSB centers from the official list link provided below. We have provided official link for SSB dates for CDS 2 2016 exams. Any questions feel free to ask below in comments. The SSB Interview Dates for CDS or CDSE 2 2016 IMA, OTA, IFA,INA are declared for some courses as of now. 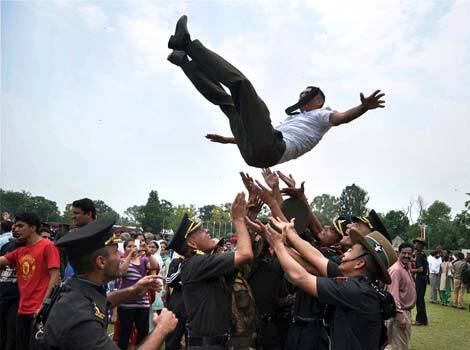 Those candidates who were declared qualified in written exam will now be called for SSB Interview. A Total of 8563 candidates qualified in the written exam. The written exam was conducted on 23rd October, 2016. (i) Indian Military Academy, Dehradun 143th Course. (ii) Naval Academy, Ezhimala, Kerala Course. (iii) Air Force Academy, Hyderabad (Pre-Flying) Training Course for (202/16F/PC) Course. (v) Officers’ Training Academy, Chennai, 20th SSC Women (Non-Technical) Course. If any candidate wants to change his/her postal address then he/she is advised to contact Army Headquarters/Naval Headquarters/Air Headquarters as per their first preference/choice. Those candidates who are not qualified can see their marks-sheet which will be posted on UPSC website after the publication of final result which includes conduction of SSB Interview and will last for 60 days on the commissions website. Combined Defence Services (II) Examination 2016 SSB Interview Dates or CDS II results and SSB Dates 2016 for various courses will be published on the website of all three Defence forces that is Army, Navy and Air Force. On successful passing of SSB and Medical exam, an all India Merit list will be published on UPSC website which will contain name of candidates who will join their respective Training academy. Generally CDS results are announced in 90 days of the written exams. so this year it will be announced in the month of Jan 2017. Aspirants who appeared for the exams keep visiting page for updates. Allahabad, Bangalore, Bhopal,are the SSB Boards in which SSB Interview of the qualified candidates will be conducted. Candidates can check their CDS 2 2016 (IMA, OTA,IAF, INA) SSB Center, Interview Dates and Merit List from the link given. Any questions in mind feel free to ask below in comments.